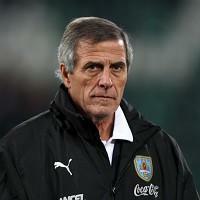 Oscar Tabarez insists Uruguay will be taking their third place World Cup play-off against Germany very seriously. Over the years the clash of the losing semi-finalists has been seen by many as little more than a glorified friendly between two sides predictably deflated after missing out on a place in the final. But the La Celeste boss is adamant there will be no such sentiments from his team, and said: "This is a very difficult game. Yes, fourth position is not the same as others, but we will go in with the same commitment and enthusiasm like we did in the encounter against Holland."